Mexican handicrafts come in all types and styles. In our Photo of the Week, Otomi dolls for sale in a doorway in San Miguel de Allende show the wonderful sense of color, the embroidery tradition and the hand-sewing skills of their Otomi Indian creators. This is Mexican folk art at its most authentic. Handmade dolls stitched by the descendants of the ancient Otomi Indians for sale in Mexico. The old-meets-new irony? This is the entrance to the courtyard of the local Starbucks. 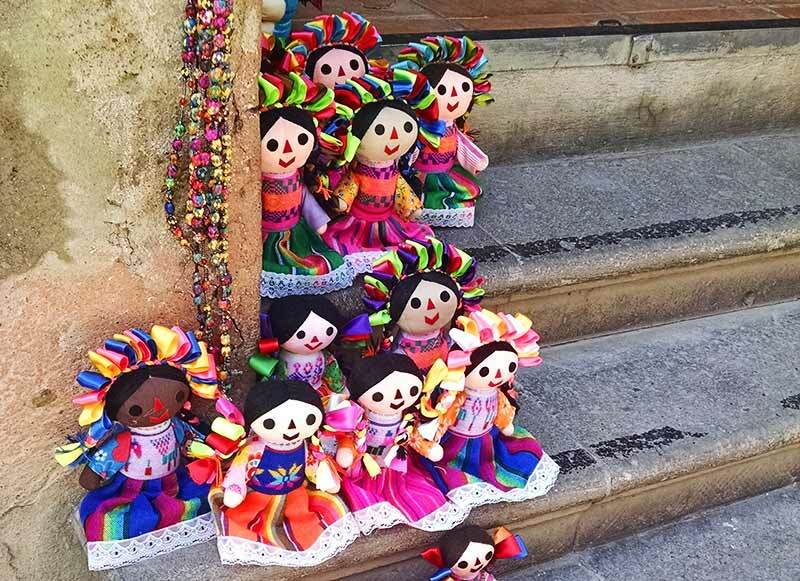 Otomi women can regularly be seen selling these beautiful and creative handmade dolls, as well as other Mexican handicrafts, all over San Miguel, especially in the streets around the Jardín, or central plaza. These sales represent a significant addition to their families’ cash flow. The Otomi Indians were here on the land where San Miguel now sits long before the Spanish came, saw and conquered. They are one of the oldest and largest indigenous groups in central Mexico and have inhabited the area for many hundreds, perhaps thousands, of years. The ancient Cañada de la Virgen pyramid and burial site near San Miguel was constructed by Otomis. This recently excavated archaeological treasure is the northernmost pre-Columbian site ever found. It dates from approximately 530 AD and was abandoned around 900 AD. Many of the rancho villages around San Miguel in the central state of Guanajuato are populated by Otomi Indians. I have met many of them personally, much to my joy. My friend Doña Maria Tovar, who lives in the rancho village of Agustín González, just outside San Miguel, is a full-blooded Otomi. Her parents spoke only Otomi, so she learned the language as a child, along with Spanish. But when she married, her husband forbade her to speak Otomi at home. He wanted his children to speak only Spanish, like good Mexicans. So her adult children now do not speak the language of her birth. But here’s a nice irony: her grandchildren are now studying Otomi in school. The government is trying to insure that the country’s many indigenous languages don’t disappear. Many times I have heard Doña Maria’s young neighbor Stephanie sing the Mexican National Anthem in Otomi. The people on these ranchos are predominantly subsistence farmers, growing their crops using the ancient and highly sustainable milpa system. Three crops are planted in the same field: corn (maize), beans and squash. As the corn sprouts and begins to shoot up, it provides support for the beans to climb. As the beans and corn grow, their leaves provide shade for the young squash. Finally, as the squash grows full, its large leaves shade the soil to keep down the summer heat and hold in the moisture. Each of the three crops adds different nutrients to the soil, benefiting them all. I have met many farmers who use this system successfully, assuming the weather cooperates. They are almost wholly dependent on a good summer rainy season, since they don’t irrigate their crops. The staple diet in these villages populated primarily by the descendants of the Otomi includes the corn, beans and squash from the field, rice, nopal cactus (with its beautiful tuna fruit in summer), homemade cheese (from both cow’s and goat’s milk), fruit (often from their own trees), eggs from their own chickens and vegetables from the garden. Meat is generally only eaten for holidays, parties and other special occasions. But then they will go all out and cook an entire pig all day long for delicious carnitas, besides roasting huge numbers of chickens to serve with mole. Cash can be a rare commodity in these Otomi villages and is always needed to buy the things they can’t grow or make themselves. If you visit San Miguel de Allende, keep an eye out for the Otomi women selling this authentic Mexican folk art in the streets around the centro. These delightful stuffed fabric dolls make a wonderful and colorful souvenir. They’re lightweight, don’t take up much room in a suitcase, and will be a great reminder of your trip to Mexico. Plus you will have the joy of knowing your money has made a difference in the life of a true indigenous descendant of the ancient Otomi people of central Mexico. For a closer look at life in the rancho village of Agustín González, whose people are mostly of Otomi stock (including a glimpse of my friend Doña Maria), check out this video of the Rancho Tour. Sixteen women in the village have also formed Las Rancheritas craft cooperative to sell their handmade hooked rugs. I enjoyed learning about the Otomi dolls. Their colors are so appealing and the faces remind me of my old friend, Raggedy Ann. I think it’s important to know the story behind some of the things we might purchase when visiting other countries. We often don’t stop to think how important even a small income can be. Thanks Betsy. You are so right. With what we might pay for a cup of coffee in a nice cafe without a second thought, these women can feed their kids for a day. Or put the money towards school uniforms. Or buy medicine for an ailing parent. It is so easy to forget how much difference we can make with so little. Thanks for that insight, Paula. I have never seen the Sarubobo dolls of Japan, but I am always fascinated about how much cross-over there is in local folk art. I have seen small metal charms from India that look almost identical to the small metal “milagros” that are hung in churches here in Mexico. So good to know something is authentic when you buy it. And providing some income for the people is an added bonus. I agree. I love buying something special and interesting directly from the maker, and especially when I know how much that small amount of money can mean to them. I’ve bought and been given quite a few Mexican dolls. These from the Otomi Indians are so colorful. My favorite doll was a grandmother doll I bought for my own mother in Copper Canyon. I have a carved wooden doll I bought from a Tarahumara woman in the Copper Canyon. It is carved from pine, I think. These Otomi dols fit well in my over-the-top colorful Mexican apartment! I have an Otomi doll; thanks for telling me about its origins…It’s also good to have the milpa back story. Much we can learn from the simple, sustainable ways of traditional practices! So nice to know you have one of these little beauties, Anita. I love my Otomi doll. And yes, I have learned so much from my Otomi friends who live out on the rancho. Their simple joy in life is enviable. Very interesting your blog Donna, on the life of Mexican Otomi people. Excellent investigative work on the tradition, the history of this people endangered. Thank you so much for visiting the blog, Bertrand. And thanks for the comment and the recommendation! Very interesting description of the Otomi dolls and the Otomi people. I guess sometimes it’s a good idea to buy a souvenir, even if you don’t particularly “need” to, in terms of how important that relatively small amount of money can be. My feeling exactly, Rachel. Which is why I like to buy directly from the maker whenever possible, rather than from a shop. I know my money is going directly to the one who most deserves it and probably most needs it. I remember seeing these Otomi dolls when I was in Mexico many years ago. I love the beautiful colors. Congrats to the Otomi ladies for having the initiative to form a co-op to sell and market their beautiful handicrafts. I agree Nancie. And it is wonderful for me to be able to see the difference this has made in their lives… not just in financial ways but in how it has empowered them within their own families and their community. And how their confidence has soared! It’s great to see.